The UK Chancellor has appeared to rule out a special Brexit deal for Scotland after saying it was "not realistic". Philip Hammond was speaking ahead of a meeting with Scotland's first minister. But the Scottish government later insisted Mr Hammond had promised to "fully consider" any proposals to protect Scotland's place in Europe. The Scottish government is currently examining ways of keeping Scotland in the European single market even if the UK as a whole leaves. It is due to publish its proposals by the end of the year. A spokesman for First Minister Nicola Sturgeon said Mr Hammond had indicated during the meeting that he "looked forward to hearing our proposals on Scotland's place in Europe". The spokesman also said Mr Hammond had given a commitment that the proposals would be "considered fully by the UK Government - in line with the specific undertaking given to the first minister by the prime minister when they met in Edinburgh in July". This appeared to be at odds with comments made by Mr Hammond ahead of the meeting, when he told journalists it was "clear that we can't have a different deal or different outcomes for different parts of the UK". He said it would be a "disadvantage" for Scotland to be outside whatever new relationship the UK negotiates with the EU. Speaking as he made his first visit to Scotland since last week's Autumn Statement, Mr Hammond said the EU itself had been "very clear" that it would only negotiate a deal with the UK, which is the member state. He added: "I know Scotland, like the rest of the United Kingdom, has important trading relationships with the rest of the European Union, but Scotland's most important trading relationship is with the rest of the United Kingdom. "That is four times more important to Scotland than its trading relationship with the rest of the European Union and it is not at all clear how being outside of the UK's arrangements with the EU could in any way advantage Scotland. "I would suggest it would be a disadvantage overall to Scotland. I don't hear that said often enough in the debate with Scottish colleagues over the European Union." Mr Hammond reiterated that he wanted to work closely with the Scottish government and the other devolved administrations in order to "secure the best possible deal" for all parts of the UK. And he added: "I look forward to us moving on from this slightly backward looking, clutching at straws, trying to resist the will of the people to embracing it, recognising it's going to happen and committing to work together to make sure it's done in a way that is most supportive of the UK economy and the Scottish economy." 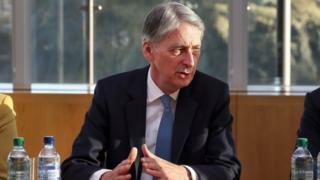 In a separate interview, Mr Hammond called for "sensible discussions" over what new powers are devolved to Holyrood after the UK leaves the EU. Control over areas such as farming, fishing and the environment will return to the UK after Brexit. But Mr Hammond said talks with the Scottish government would be needed to decide how those powers were allocated. The chancellor has said that measures outlined in the Autumn Statement would add £800m to Scotland's capital budget over the period until 2020-21, which would allow Scottish government to "invest significantly in infrastructure". But analysis by the IPPR Scotland think tank said the Autumn Statement would create a "very significant and unprecedented spending squeeze" for many public services in Scotland. New powers over income tax were formally devolved to the Scottish Parliament on Wednesday, with Scottish ministers able to makes changes to rates and bands from April of next year. And Mr Hammond said Scotland now had the "fiscal autonomy that it has long been asking for", with the Scottish government able to raise more money if it wants to spend more. Nicola Sturgeon told MSPs on Thursday morning that she would "say very clearly to Philip Hammond this afternoon" that it was "not acceptable that the Scottish government budget will be reduced by £2.9bn, 9% in real terms, by the end of this decade compared to when the Conservatives took office." She also said: "Increasingly it is very difficult to distinguish between the Conservatives and UKIP and anybody in any doubt about that need only look this morning at what are reported to have been (Prime Minister) Theresa May's views on denying education to children living here from certain other countries in certain circumstances. "On the question of the single market, I am absolutely consistent in this, I think the UK should stay in the single market. I don't believe there is any mandate or any economic, social or cultural justification for taking the UK out of the single market. "I will make that point to Philip Hammond this afternoon as I have made that point to the prime minister and to others in the UK government."